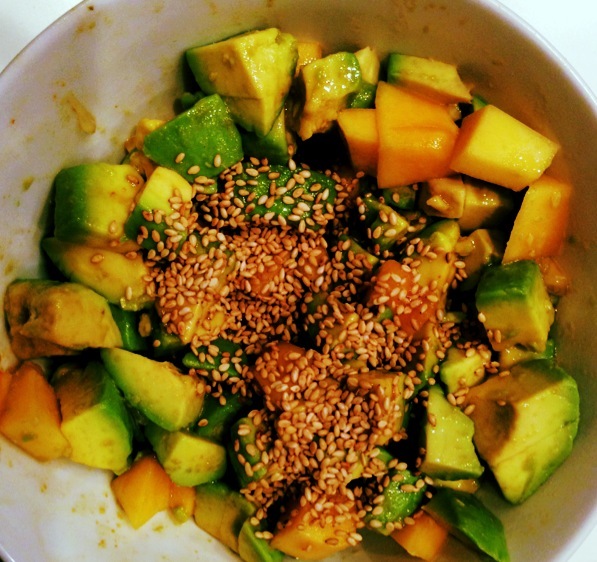 I love Sesame Oil not only for its health benefits but I also love the flavor! Sesame Oil is one of the super, super foods that can be used for its i.e. anti-inflammatory qualities, it’s good if you have cardiovascular issues, it lower the cholesterol and so on, the list is very long and you can read more about the benefit from sesame Oil here http://shop.vedalila.se/en/art/article-60.php. How to: Start by cutting the kitchen into pieces and mix together the marinade. Meanwhile you are letting the chicken infuse in the marinade mix prepare the Avocado salsa by cutting the avocado and the papaya into small pieces. Squeeze the lime juice and mix in the soy sauce, sesame oil, sambal oelek, salt and pepper and keep it cold till you are ready to serve. Preheat oven to 425F. Toss cauliflower with 2 tablespoons of olive oil and 1/2 tablespoon of salt. Spread onto one layer on cooke sheet and bake for about 15-20 minutes (or until cauliflower is slightly browned / you can stick a fork through it pretty easily). In the meantime, in a small saucepan heat the remaining olive oil. Saute the garlic over low heat in the oil until it starts turning brown. Turn off the fire and add in the tahini sauce, water, and remaining salt. Squeeze the juice from the lemon and then mix all of the ingredients together to help it shape into a more sauce-like form. This entry was posted in Recipes and tagged chicken, clean food, dinner, fitness, food, healthy-living, low-carb, motivation, recipe, sesame oil, weight loss, weight training by Malin. Bookmark the permalink.